The Klipsch Synergy Series SC-1 center channel delivers crisp dialogue together with dynamic impact and an impressive sensitivity of 95dB. Despite its extremely high-performance capabilities, the SC-1 is available at a very low price. The SC-1 uses the same 1-inch aluminum diaphragm compression driver and 5-inch square Tractrix® Horn as the SF-2 for high frequencies and two 5.25-inch graphite-injected woofers for the lows. Other class-leading design features such as high-definition crossover networks and internally braced enclosures ensure optimal performance. 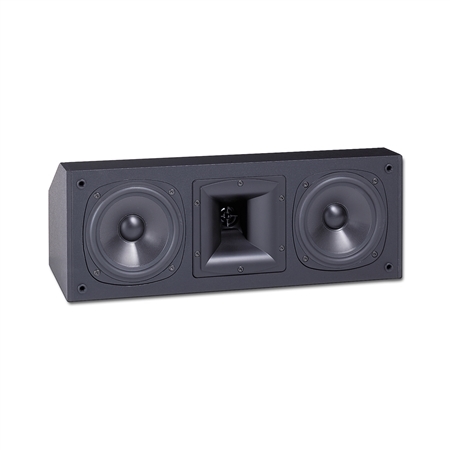 The unique venting system of its cast polymer woofer frame cools the voice coil to enhance reliability. The SC-1 has a multi-angle enclosure that facilitates placement either above or below a television screen. It also features a "floating" or suspended grille that reduces image impairing sonic reflections and complements the jet ash vinyl veneer finish. This center channel was engineered to reproduce all the detail subtleties and dynamics required for a true-to-life home theater experience. While no longer in production the SC-1 is still owned and listened to by Klipsch fans around the world. To connect with other people who are passionate about audio and interested in Klipsch products visit our open forum bulletin board.